Join us to see a new, intuitive approach to the creation of live television that utilizes the power of modern graphics processors and touch screen user interfaces. Operators can now learn to create live programming, including multi-layered graphics, complex transitions, and pre-planned event sequences in a few hours instead of many weeks. David Griggs of Grass Valley, A Belden Brand, will discuss the technology behind the new GV Director live production switcher. 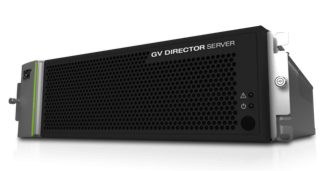 See how the new GV Director from Grass Valley combines the functionality of a live production switcher, video server, and graphics generator into a simple, powerful, and creative workspace.